Choose roller shades for your home or business in Thornbury if you want window treatments that are easy to clean. Have you been thinking about getting new window treatments for your home or business in Thornbury, Ontario, but you don’t know where to get started? 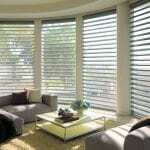 If you are looking for an expert in window treatments, give us a call here at Ashtons Blinds. With over 15 years of experience, we can take care of your window treatment needs, from design and selection to installation and repair. There are many options available: Whatever pattern or colour you are looking for, we can probably help you find roller shades to match. You can also choose to have cordless lift shades, continuous loop shades and even motorized shades. They are easy to maintain: Once they are installed, roller shades are fairly easy to care for. Simple cleaning keeps them looking like new long after installation is completed. They are good for many different rooms: Because they can come in many different opacities, roller shades are a good option for a variety of rooms. Blackout shades may be best for a nursery or home theater, while light-filtering options may be best for kitchens or living spaces. Help with your new window treatments is just a phone call away. When you call us for your free consultation, we will bring all our product samples to your home or business. We will match your décor, needs and lifestyle (as well as your budget) with the ideal window treatments.